Home / Columnists/ Students’ troubles in universities: A question of misconceived cultural property rights? Students’ troubles in universities: A question of misconceived cultural property rights? Sri Lanka’s state-owned universities have always been hotbeds of trouble. Troubles are good for universities if they are in the right direction. Universities are knowledge-makers and knowledge-making comes from troubling the existing knowledge. If there is a problem or trouble out there, university academics together with students go on ‘troubling the trouble’. In that manner, they find solutions to the problem at hand. That is how the world has heard of the leaders in the trade like MIT, Harvard, Princeton, Oxford or Cambridge. They trouble the trouble and come up with new inventions that add to their good track record and also serve the mankind at large. If, on the other hand, a university purely goes by the knowledge which it had in the past or is having in the present, then, there is no new knowledge created. Hence, for universities to do what they are expected to do, they should always be hotbeds of trouble. But, Sri Lanka’s state-owned universities have become hotbeds of trouble for the wrong reason. Instead of finding solutions to existing troubles, they have been noted for creating new troubles for themselves. Worse, they leave those troubles without a solution thereby entangling the society too in their troubles. When the frustrated society tries to come out of those troubles, they disrupt that process too. It leads to creating one trouble after another and bring forth a series of troubles which cannot be solved easily. The end result? The failure of the university system in the country to do what it is expected to do, namely, functioning as society’s knowledge builders. It disrupts education, stunts research and development and pushes universities back to the past. Two recent events at two leading state universities have been the latest testimony to this unsavoury development. One is the renewed wave of ragging at the University of Kelaniya which is not common only to that university. The other is the clash between a section of Sinhala students and Tamil students at the University of Jaffna. The first is intolerable but could be confined only to the locality of the respective university. The second is to be abhorred and should be nipped in the bud before it becomes the source of another gruesome nationwide ethnic clash. Both the ragging and the student clashes have been prompted by a sense of entitlement which the students involved believe that they hold it by right. I call this entitlement ‘cultural property rights’. These cultural property rights differ from ‘economic property rights’ which economists uphold as necessary. A property right is simply the right to a valuable asset which enables its holder to gain a benefit. Such property is of two types. One is the physical property like vehicles, plants, factories, land or buildings. The other is the human property that takes the form of physical labour or knowledge or both. The holders of such physical and human properties stand to earn benefits for themselves by disposing them in the market in any way they like. Economists hold that the protection of property rights is a must for any economy to sustain itself and move forward with efficiency and efficacy. Thus, they are called economic property rights and centre on individuals. Cultural property rights are the rights of a group of persons to practice, prosper and develop their own cultural values. Hence, they are group-centred. They take numerous group behavioural forms acceptable to and approved by the group. Of them, some important aspects are how people in a group dress themselves, what types of foods they eat, how they practice their religions, how they entertain themselves, how they have social interrelationships and so on. They are inherited from previous generations and passed onto the subsequent generations with only little change. Since groups consist of human beings who have the capacity to learn and adapt new things, it is quite natural for individual members of a group to change their behavioural pattern when they come across with another culture. But such changes are not tolerated by the group and sometimes resisted using violence on those who propose to change. Thus, economic property rights can change in mutually acceptable or voluntary market exchanges. For instance, an individual can sell his car to anyone who is willing to pay the highest price for it. It is a voluntary exchange and no one can force him to do so. However, cultural property rights are inherited and cannot be changed even when a person is willing to do so if the group does not approve of it. It is very rarely that a cultural group makes such a decision. Ragging is a sub-cultural practice by students in Sri Lanka’s universities. They learn it from their previous batches and pass onto their subsequent batches. On the last day of ragging, one of the pledges which the newly ragged freshers have to make is that they too will practice it on the new students who enter the university the next year. Then, those students who become seniors will rag the new students who enter the university and get the same pledge from them too. Thus, it is repeated year after year and it survives like a religious cult within the university system. That is why it is difficult for university authorities to eradicate it by using conventional punishment systems. Sri Lankan universities have been modelled on British universities and many believe that the ragging practiced in Sri Lanka has been adapted from them. British universities too have a system of ragging but it is completely different from the system being practiced here. In the British universities, it is the senior students who are being ragged mostly and not the freshers as is the case in Sri Lanka. I have the experience of observing the ragging that took place at the University of York, UK, in 1977. There is a ‘rag week’ and it takes place not in September when the new students are admitted but in February when the Spring Semester starts. It is organised by the university’s student union with deliberate pre-planning done with full cooperation of the university authorities. The details of the rag week organised by the University of York Student Union in 2016 have been given in the university’s official website and they are not different from what I had observed nearly 40 years ago (available at: https://www.yusu.org/opportunities/rag). The rag week is announced by the Vice Chancellor and it consists of a week of events by students aiming at raising funds for a good cause. Students are coaxed to participate in the events voluntarily. There are social events, entertainment in the nights, sports, challenge walks, numerous fund raising campaigns that enable the students to support a charity at the end. Thus, there were dancing, singing, martial arts demonstrations, food fairs and various other activities hosted by students coming from different countries and cultures. Students in all the four years participated in these events voluntarily. The challenge for them in 1977 was to build a hypothetical wall of 25 pence coins from the university’s Library Gate to the York City Gate which had a distance of about 4 km. The student union had calculated the amount of Sterling Pounds needed to build this hypothetical wall when standing coins are placed touching each other through this distance. Then, targets were given to each student group to raise funds. I recall that by the end of the week, students at the university managed to raise more than the needed amount to erect this wall. At the end of the week, at a function attended by all the students, the Vice Chancellor congratulated them on the successful completion of the rag week and the raising of funds for donation to a charity. If the objective of ragging is to help students to fight away shyness, bring forth their hidden talents and build interpersonal relationships, this type of cross-cultural events done voluntarily serve that purpose best. In the rag week, there is an event for every student. It is open, fully sponsored by university authorities, voluntary and meant for a good cause. All universities in the UK have similar rag weeks organised with sponsorship of universities by student unions. Since the cult practices in the sub-culture at Sri Lanka’s universities cannot be eradicated through punishment as suggested by some, this is a good practice which Sri Lanka’s university authorities could consider adopting. 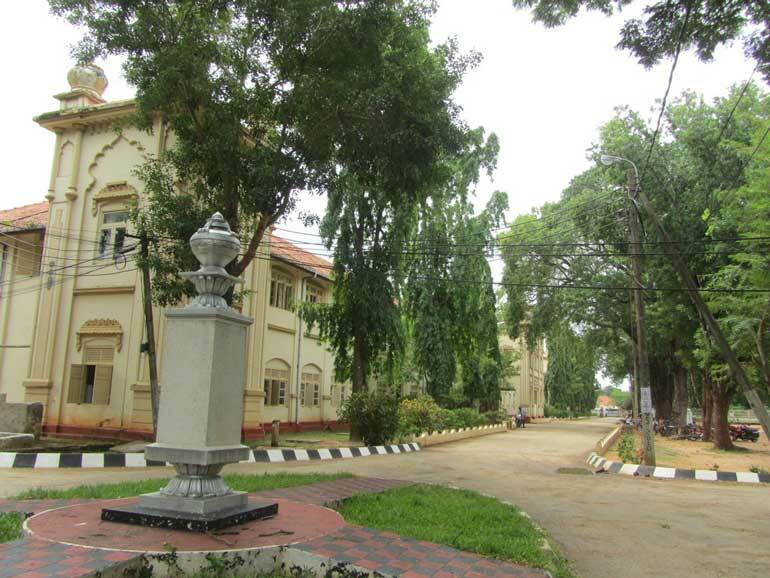 The clash between the Tamil and Sinhala students at the University of Jaffna has been due to each party attempting to impose its cultural property rights on the other by force. The details of what happened at Jaffna University have been described by writer D.B.S Jeyaraj in an article penned by him (available at: http://dbsjeyaraj.com). It is a display of intolerance, failure to appreciate and respect the cultural practices of others and disregard of the mental state of the opposing parties. In other words, there has not been a ‘give and take’ strategy practiced by the clashing student groups. The reading of this clash through a Buddhist eye has been done by Rev Galkande Dhammananda Thero, Senior Lecturer at Kelaniya University and Head of the Walpola Rahula Institute of Buddhist Studies in a video published in YouTube (available at: https://youtu.be/OMCgcLl6sY0). The root cause of the clash which can take place at any university or a school in Sri Lanka is clear. Children in Sri Lanka are being brought up in separate compartments where they learn only of their own cultural practices. Right from early childhood, a superiority complex is inculcated in them. That complex is based on fear of change and fear of invasion. Because of language difficulties, there are limited inter-communication opportunities among different ethnic groups. Sinhala children basically know only Sinhalese and Tamils only Tamil. Hence, there is no way for them to learn, appreciate and respect the cultural practices of other ethnic or religious groups. The end result is that attempts are made at every opportunity possible to superimpose one’s cultural practices on the weaker groups. What is needed is to allow students to grow in a multicultural environment where they not only participate in the cultural events of other ethnic or religious groups, but also begin to respect and appreciate what is alien to them. An experiment was conducted in the Business Management School, popularly known in its acronym, BMS, to attain this goal successfully. BMS is a private higher learning institution which offers principally the degree programs of the UK’s Northumbria University in Sri Lanka. It is multicultural in all aspects with a student population of about 1,000 coming from all ethnic and religious groups in Sri Lanka. Thus, its student union has the responsibility for building sustainable coherence among its membership. Accordingly, it organises, with the full and active participation of all the students, the celebration of the major ethnic and religious events in Sri Lanka. They celebrate Thai Pongal and Deepavali, Sinhala and Tamil New Year, Vesak, Ramadan and Christmas in a grand manner. It is encouraging to see that all students take part in these celebrations without exception. Sri Lanka is currently faced with the problem of reconciliation among different ethnic and religious groups. There is a fear harboured by each group of the other groups. This fear has caused them to live in separate compartments protecting their own and belittling others. This has to be stopped if the country is to attain true reconciliation. It is a long journey but has to be started at some point. The best place to start it is the family where children are taught to respect and appreciate the cultural practices of others while upholding their own. Then, it has to be carried to schools and finally to universities. This is the only way to beat the misconceived cultural property rights among students.